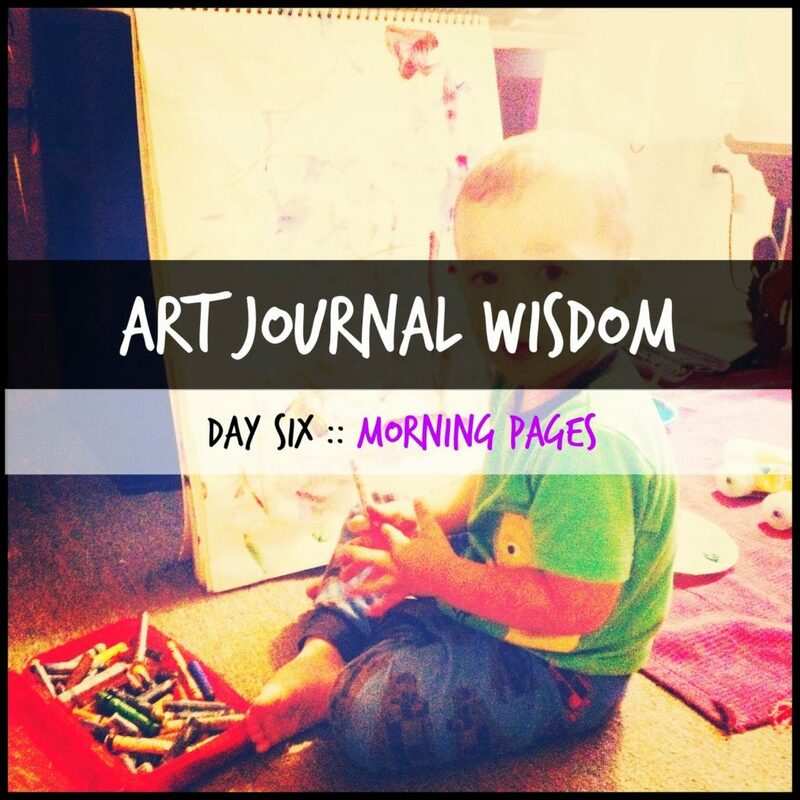 Welcome To Day Six of Art Journal Wisdom! I want to share with you something very near and dear to my heart: morning pages. 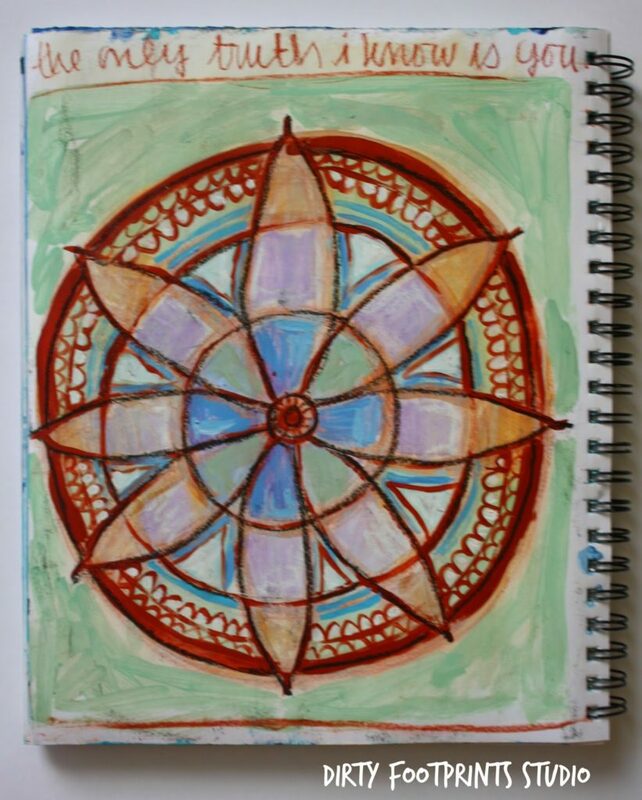 Morning pages is a key component of my own personal Creative and Spiritual Practice. I tend to be a person that gets up at the crack of dawn eagerly. Morning is my most absolute favorite time of the day and to spend it in the studio feels like a blessing for the day to come. My morning pages started about 8 years ago when I used to work full time as a public school art teacher. It was then that I would give myself this 20-30 minutes each day to play with paint before I had to dedicate my entire day to others’ creativity. Back then morning pages kept me sane. Now-a-days they feel more like a prayer or a way to communicate with my higher Self. I always work intuitively when I approach my morning pages. Meaning, I don’t begin with an agenda for it to look like anything, but instead I choose a few colors calling me that morning and see where things lead me. Personally I think everyone should start their day off in the studio! Not only does it feel good to do something you truly love first thing when you get up — but there’s something innately peaceful and sacred about mornings. I love to witness how the sun dances outside my window and I’ve gotten really good at knowing what time it is just by the different shades of copper and gold that the sun spills across the rooftops. I feel strongly that how we begin our day usually defines how that day will unfold. I choose creativity and alignment. 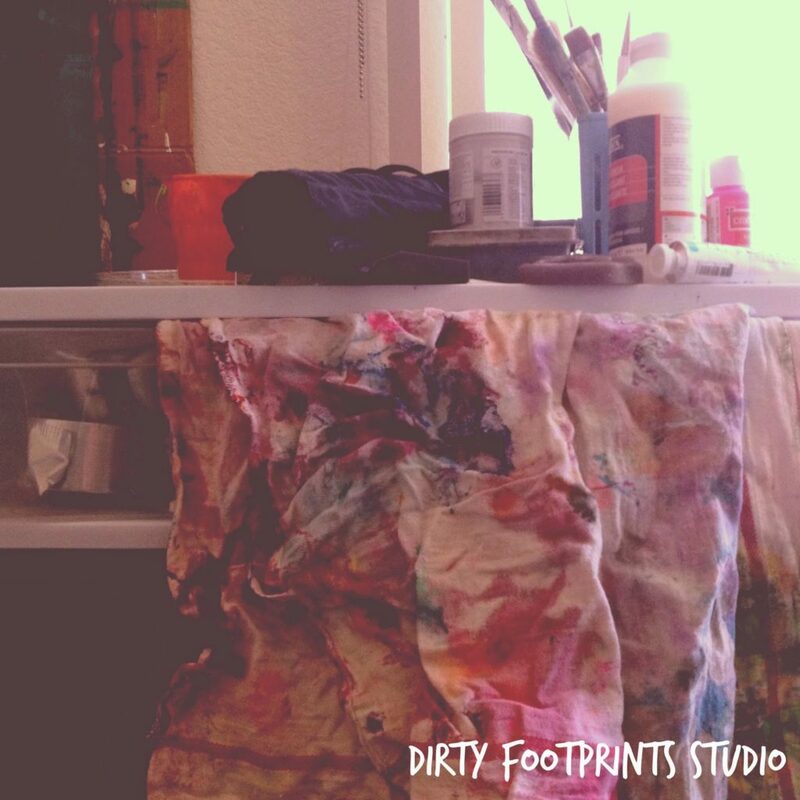 What is most important is creating a daily creative practice that fits into your life. It truly doesn’t matter if it’s in the morning, evening or during lunch time! And to be honest with you, back when I was a public school art teacher, on those days that I couldn’t squeeze in my morning pages for whatever reason I would instead sneak it in during my lunch hour! And yes I’ll admit, there are days –sometimes even weeks or once in a while a month or two that this practice slips me by. My world doesn’t crumble to pieces because I haven’t done my morning pages, but I’ll tell you that I tend to. When I don’t attend to my daily morning pages I notice that I’m more moody, more cloudy, and sometimes even more difficult to be around — even for myself! Over these 8 years I’ve come to rely on this practice to ground me and it never fails to do so. Like I said, I think everyone should commit to morning pages, but it’s definitely one of those things you need to experience for yourself to fully be aware of what difference it makes in your own life. Even a mere 15-20 minutes will do the trick! Think about it….20 minutes a day equals a little over two hours a week! Who wouldn’t want an extra two hours a week in the studio!?! Plus, lets face it — the more you practice the more comfortable you will become with your creativity and the better you will be at your craft as well. That’s a huge pay off in itself! Here are some tips to get you rolling! Give yourself a personal challenge to jumpstart your practice! 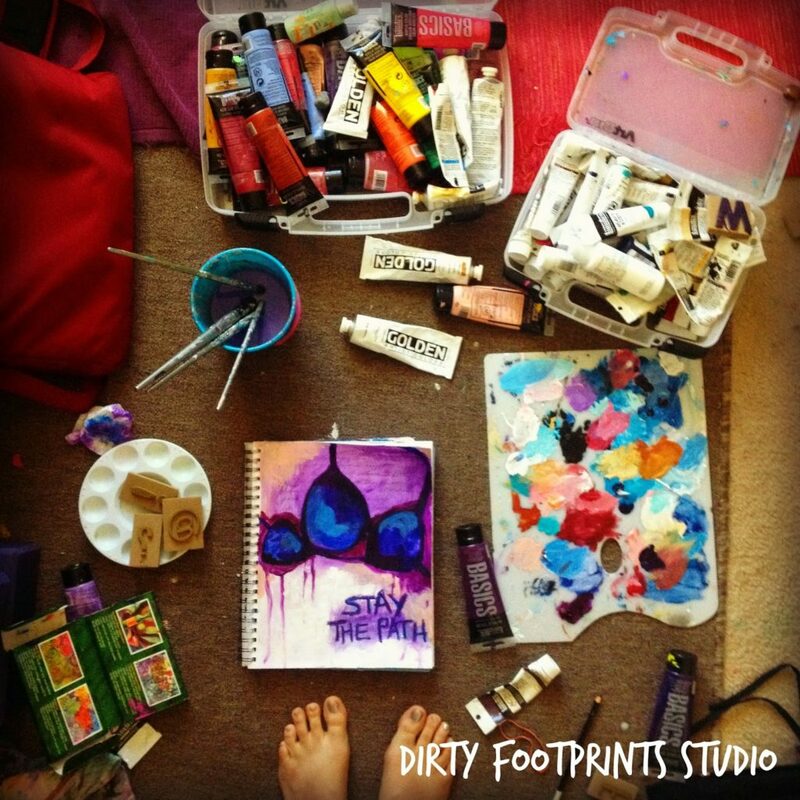 Commit to 21 days of art journaling or 30 or a 100 if you’re feeling extra feisty! But when you do a challenge like this set yourself some yummy little goals along the way. Any time I take on a challenge or a long term project I set myself little trail markers to hit and rewards I’ll receive when I get there. 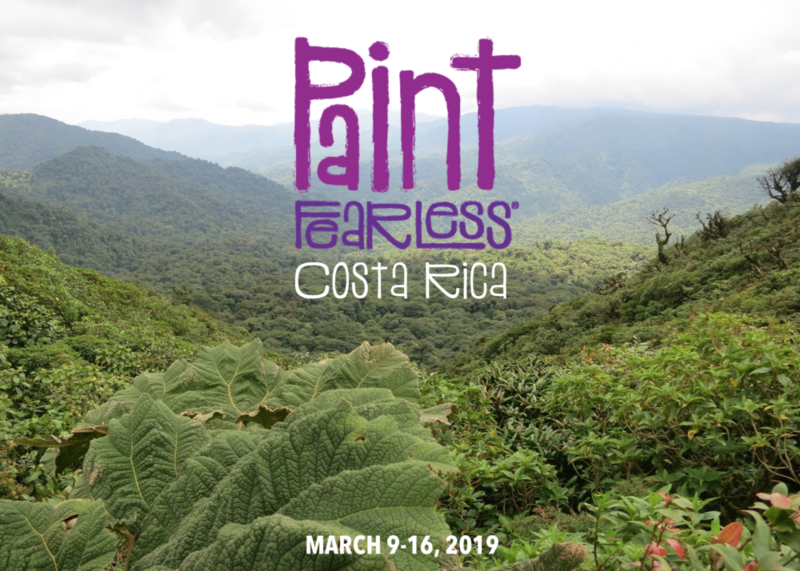 So how about rewarding yourself a new fancy paintbrush or a special evening of pizza and wine if you make it to 10 days, 15, or what have you! Work small. When I was first starting my morning pages I used little pieces of paper that were about 4 inches by 5 inches. This was just the perfect size to tackle in the morning before work. Now-a-days my morning pages are in an art journal, but instead of using both pages as my spread I focus on only one page. Half the space — half the time. 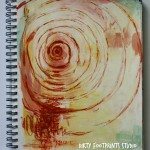 And as we learned here in Art Journal Wisdom, limiting yourself can be fun! Keep it simple. 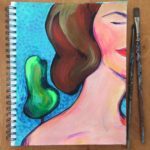 If the hassle of setting up and cleaning up paints and brushes is just too much for you and keeping you from committing to your practice, then improvise and use something else more immediate and with less mess. I prefer oil pastels of course! But a pen doodle on one of those sticky notes would be fun too! Get creative and make it simple. Spread it out. Who says that you need to create something new every dang day? How about committing to one piece that evolves all week long? Every day you could transform it a little more and it will begin to take on a life of its own! Set up the night before. If you are going to invite in morning pages I encourage you to set up your work space before you crawl into bed the night before. That’s what I do. I have my water ready, brushes out, and my paints waiting for me to wake! 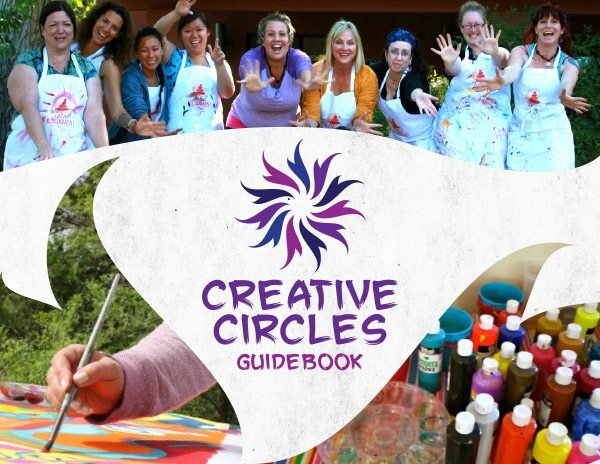 It doesn’t take much to do and it can become a Creative Spiritual ritual even. How sweet is that? Make it a habit. The best advice I can give you around creating a daily creative practice is to make it a habit. Choose a time of day and do your best to stick to it. Schedule it in on your planner or plug it into your iPhone calendar even. Set yourself little reminders and make it a habit to meet with your art journal at the same time each day. What you’ll start to notice is that on those days you don’t you’ll really feel the effect of your commitment and it will keep you on track! Use social media to hold yourself accountable. Lots of times I post my own photos of my morning practice on Instagram. This way I am publicly committing to this practice as well and its so energizing when others support you online or join in inspired by your courage to commit! So put yourself out there and commit to posting your work on Facebook Instagram, or even your own blog. Plus, once you start rolling it will be so cool to have documented the journey! Forgive yourself if you flub! It’s ok if you miss a day or two or how many, as long as you jump back on the wagon and commit to yourself. So on those days when life gets too crunchy or sleep has won its battle with you — be kind to yourself. You’re a human not a machine — and actually a little variety and change is good for our creative practice anyways! Make it fun! Play music! Dance around! Play! Play! Play! I can’t stress enough how important it is that your daily creative practice be fun and light (especially when you’re starting out). You should want to be there. Seriously, why else would you commit to something on a daily basis if it didn’t bring more joy into your life. So if you find yourself dreading your practice or bored out of your mind — that’s your sign that its time to shake things up a bit! Take a class. 21 SECRETS comes out every Spring and Fall. This is the perfect workshop to keep you inspired till the end of the year and beyond!! How awesome would it be if you slowly moved your way through the content focusing on one course a week! Taking a class is a great way to keep your morning practice inspired and thriving!! So come on over to 21 SECRETS and let us be your guide! Get other hearts involved. There’s no reason you need to do this alone. How about inviting the kiddos, the spouse, or even the neighbor down the street! Got no one near that can join you on your daily creative practice? Then setting up Skype dates with a friend from a-far works just as well too! I have many dear artist friends that live thousands of miles away — some in other countries actually and its always such a joy to meet on Skype to paint together!! Reach out to someone you know online and get some art dates going!